How many stylists does it take to create those slick Christmas table settings you see in magazines? Answer: one. Plus an assistant or three. And a decent budget, and access to every homewares store in the country, and great lighting, and a food stylist, and a clever photographer. But you won’t need any of that to create these five looks. Sometimes the simplest colour scheme is the most effective, and palettes don’t get much simpler than monochrome. A white table is a good start (or a plain white tablecloth). Place a black runner down the centre, and arrange white objects – vases, candles, sculptural pieces – down the length of the runner. White plates, black napkins. Now add the gold, starting with gold cutlery. Sprinkle the table with decorative gold stars; use gold ribbon to tie napkins. Keep flowers simple: white hyacinth bulbs in small white pots would be ideal. Mirrors, glass and silver will add drama and depth. Use mirror tiles to create a table “runner” and as placemats. Fill different-sized glass containers (mason jars, jam jars, vases) with silver Christmas baubles and arrange down the centre of table; scatter small silver tea-light holders and elegant silver baubles among glass objects. 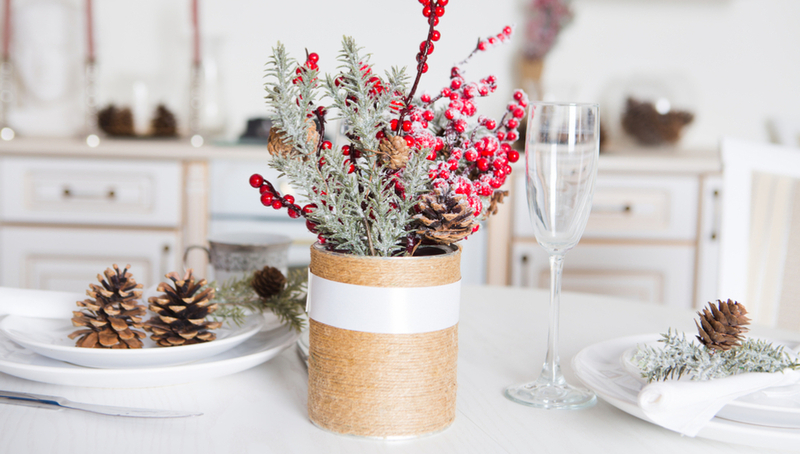 Spray-paint small branches and twigs in silver and arrange in the vases. Good silver flatware and lots of glassware (bring out the champagne flutes, elegant water glasses and red and white wine glasses) are key. 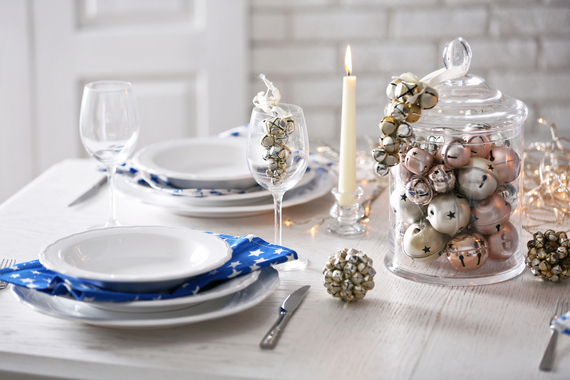 Layer white napkins between dinner and entrée plates, and tie plates with a large silver ribbon. Here, neutral tones and nature combine to create a subtly chic setting. Use hessian as your tablecloth, and round rattan or bamboo placemats. Vintage-style cutlery and glassware would be best. Decorate white plates with neutral-toned napkins tied with string (tuck a sprig of rosemary and a cinnamon quill under the string). Native greenery, and lots of it, is key to this look … think soft-toned banksias in old enamel jugs. Intersperse with white candles in varying sizes. Bring a little Mexico to your Christmas celebration with bold fiesta colours. Start with white basics: tablecloth and plates, silver flatware. Then start adding layers of colour: glassware in shades of blues, greens and pinks; bright napkins tied with a sparkly Christmas bauble; super-bold flower arrangements in glass jars. Succulents would be perfect here: buy several small clay pots and paint in vibrant shades, then fill with succulents and cacti and scatter along the table. Blacks, dark blues and greys will create a little Christmas Eve or Christmas night drama. A dark grey tablecloth is your starting point, complemented by metallic cutlery in gold, copper or bronze. 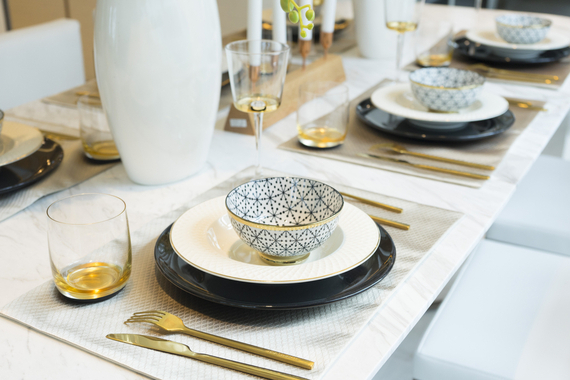 Opt for dark-hued plates and napkins with metallic napkin rings (or use a metallic bauble to decorate). Tall black taper candles in metallic candle holders or candelabras make the perfect centrepiece. Wrap succulents in brown paper tied with black velvet ribbon for an elegant touch of greenery.